Daniel Day-Lewis delivers a tour de force performance as Abraham Lincoln in Steven Spielberg’s engaging and unexpectedly entertaining interior epic. Those are Lincoln’s first words in the film and they’re in keeping with a recurring theme in Spielberg’s war movies: identifying war’s previously forgotten victims and heroes. In Schindler’s List, there was the opening roll call of Jews being sent off to concentration camps. In Saving Private Ryan, the opening sequence, at a Normandy cemetery, displays row after row of crosses, each cross etched with a fallen soldier’s name. Here, the question is directed to a series of soldiers Lincoln is visiting. There’s a couple of African-American soldiers; they speak of outlandish dreams, such as – perhaps – black men earning the rank of colonel within 5 years and maybe even being granted the right to vote in 100 years. Then there are a couple other Yankee soldiers who tag-team a recitation of the Gettysburg Address. It’s January 1865 and from here the bulk of the movie focuses on Lincoln’s campaign to craft and adopt the Constitution’s 13th Amendment, which abolishes slavery, before the Civil War ends. It’s a tightrope trick of political ambitions; ending the war sooner than later is always desirable, but doing so could very well kill off the incentive to end slavery. And so it is Lincoln must work with his “team of rivals” (the movie is based, in part, on Doris Kearns Goodwin’s historical look at Lincoln’s political machinery). Prior to Lincoln’s relaxed conversation with the soldiers, the opening scenes in Lincoln depict a grisly Civil War battlefield. It’s akin to Spielberg’s work in Saving Private Ryan and War Horse; the view is of brutal, unflinching barbarism as Confederates and Yankees duke it out in bare-knuckle brawls on a muddy, treacherous landscape. After that opening action, Lincoln requires a bit of patience in adjusting to the movie’s pace. There’s a lot of dialogue that demands attention, but as the movie settles in, the effort is rewarding. In some respects, Lincoln feels like David Lean’s Lawrence of Arabia, an interior epic, to use Martin Scorsese’s description, which provided a take on T.E. Lawrence that swooned with the romance of Lowell Thomas’ With Lawrence in Arabia while also nibbling at the internal conflicts of a man more at comfort in Arab robes than army fatigues. 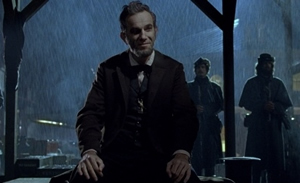 Here is President Lincoln, a truly self-made man, largely self-educated, who is more comfortable engaging in one-on-one conversation with ragged soldiers and the general public than with his own family, which features a troubled relationship with his wife, Mary (Sally Field, Forrest Gump), and older son Robert (Joseph Gordon-Levitt, The Dark Knight Rises). Also like Lawrence, Lincoln knew how to work the system and once again proves it’s downright difficult for great men to accomplish great things without at least a tinge of scandal. In Lincoln’s case, he used the power of persuasion and the power of the purse to procure positive votes. That more intimate look at how Lincoln ticks is one of the many aspects of this bio-pic that helps flesh it out beyond being a single-focused look at the 13th Amendment’s passage. America’s chaotic political system is presented in all its unflattering glory. There’s an unusual comforting sensation, like a salve, in seeing all the bickering, some of it quite nasty and spiked with personal attacks and derision, among the Democrats and Republicans. While it’s so disheartening to see in today’s ceaseless play-by-play thanks to the 24-hour news cycle and degradation of journalistic integrity in all forms of media, such rancor has been part of the game all along. Of course, back then that hostile political machinery was also balanced by a much more approachable presidency. Personal audiences with members of the general public, as depicted here, were quite commonplace in those days; people could address their concerns and requests face-to-face with the president, one-on-one. Sadly, such accessibility faded away as the dangers to the president increased over time and presidents, such as Teddy Roosevelt, had to rather reluctantly put up more safeguards in the name of self-preservation. And it’s also interesting to see the political tides shift to and fro as the Democrats staunchly defend slavery while the Republicans seek to set a path of true freedom for all. Those tides shift, or at least most certainly the perceptions of those tides, through the ebb and flow of time. Thanks to a colorful cast of historical figures that includes Thaddeus Stevens (Tommy Lee Jones, The Fugitive) and Edwin Stanton (Bruce McGill, W.), Lincoln also manages to find the humorous side of the raw informality of American government past. Some of the humor is played broadly, but some of it’s of a gentler, quieter nature, such as when a burnt map corner draws the ire of a war minister. It’s government property, after all, and the fact that the mischief of Lincoln’s youngest son was the catalyst for said damage is simply not acceptable to the irritated cabinet member. As can rightfully be expected from a Spielberg film, there’s artistry in his use of the cinematic language, as with Lincoln’s dream of being on a ship taking him to unknown territory and a scene in which Lincoln exists the White House to meet his fate at Ford’s Theatre. Perhaps the movie should’ve ended right there; it would’ve been a perfect way to close, with Lincoln making comments on his way out of the White House about how he’d like to stay, but he has to depart. Cleverly, though, the next scene cuts to an entirely different theatre where the play is interrupted to announce Lincoln’s shooting. It’s an announcement made in front of Lincoln’s youngest son, sitting in the balcony stage left, much like Lincoln himself at Ford’s. That in itself is a nice touch. Through it all, Day-Lewis captures Lincoln’s well-documented cadence and mannerisms (right down to Lincoln’s almost mechanical, steampunk-style gait) while war expedites the aging of Lincoln’s fragile frame (he’s aged by 10 years within one, General Grant observes). After seeing Day-Lewis’ striking performance, it’s interesting to consider that Liam Neeson was Spielberg’s long-standing choice for the role while the production gestated for something on the order of 20 years. While Neeson certainly has the profile for Lincoln, his current action-star status would seem to make him too buff for the role.